This is my final card for the Growing in Unity - Day 5 and I created this elegant from the SMAK kit 7/12. I used more zig clean color pens and stamped the image with Stazon ink. 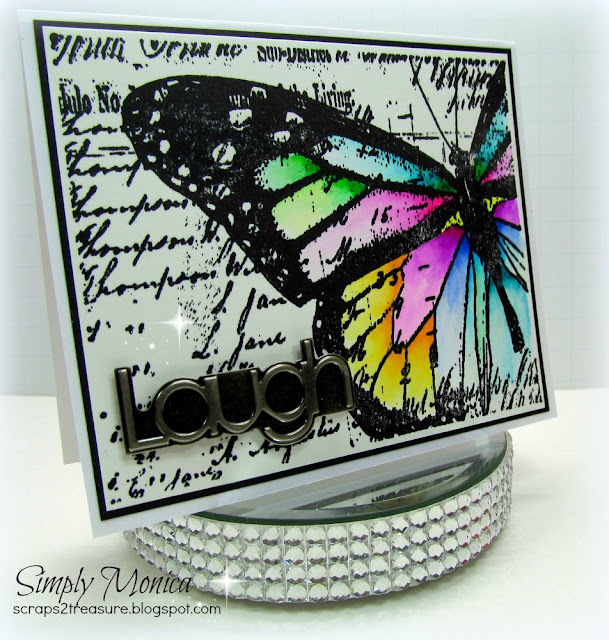 Be sure to comment you never know if you will be the lucky winner of 25 Unity Stamp company stamps!! Now you can't beat that for a prize right!!! 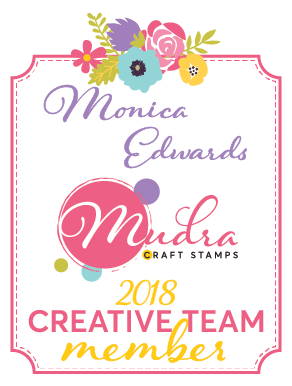 pretty card Monica, love the stamped image and your coloring. the 3d laugh is perfect touch. What a great image! You really made the butterfly pop with the color you added. Thanks for a wonderful week of inspiration! I just LOVE how you only focused on coloring one part. It really makes the beauty stand out. NICE JOB. Love the butterfly!!! The colors make it look like stained glass. Love your card. I'm not really a butterfly fan but this I love! My favorite card of the week. Love the beautiful butterfly image! huge fan of a script background. This is beautiful! Thanks for sharing all week. I love this card, and i love all the cards you did this week, good job Monica. Beautiful colors on the butterfly. Lovely card and I really like the laugh embellishment. this is so beautiful! Such vibrant colors! Fabulous use of a SMAK kit. Just awesome. Love that beautiful butterfly and the colors you used! Pretty card and a great wrap up to your GIU week! Super creative. I love the LAUGH at the bottom! We all need a good belly laugh to relieve stress!